Well, this post is posted a little later than normal because I seriously have run around today (Sunday) like a chicken with my head cut off. 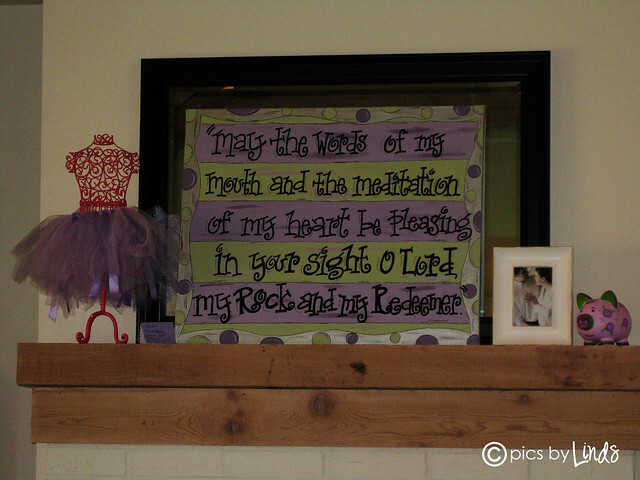 But rather than start at the end of our weekend for my weekly weekend in review, it seems necessary to start at the beginning of this oh so crazy weekend that we've had here at our house. If you don't remember, earlier this week I had left the freezer door open to one of our deep freezes in the garage, which caused us to lose several pounds of beef and the equivalent to about 2 processed deer, plus some other frozen groceries (box of waffles-- from Sam's, so it was a big box-- some fruit, frozen pizzas, etc). Thankfully I have a gracious husband. Well, the next day, after transferring what could be salvaged to our other deep freeze and our indoor freezer, I realized the stuff in our indoor freezer/fridge was not freezing completely. A call to the tech and two service calls later, we realized our fridge had a slow leak and needed to be replaced. Like, that day, which was Friday... AFTERNOON. Problem was, Drew was planning a camping trip on Friday and Saturday with two of his good friends. So, after B woke from his nap on Friday, I lugged him around to the two different appliance stores searching for the recommended fridge. Called around to several other stores to price match, went back to the first store I went to, and purchased the fridge by myself and arranged for delivery on Friday. Neeedless to say, after an hour of running back and forth, B was NOT happy. Since our food was all either frozen or semi-warm, I decided I'd treat me and B to Chick-Fil-A. Great idea, other than the fact that B thinks that we should just PLAY at Chick-Fil-A and not EAT. So for the first 10 minutes or so, he literally screamed nonstop, SO loud. It was awesome (please note my extreme sarcasm). Thankfully he finally died down and ate his kids meal, and then I let him brave the rampage of wild, unattended children in the play area, where he thought the wild, unattended children were the best entertainment since Veggie Tales was invented. It scares me to think what he will be like when he is at that age ((((SHUDDERING)))). I got home right at bedtime, washed him off quickly, and enjoyed the rest of the evening of peace and quiet to myself. Saturday I woke up thinking we'd have warm milk, but to my surprise the refresh of freeon that the tech had given our fridge the day before had worked a little, and actually FROZE our milk solid. SO, we still had to go get donuts since we had frozen milk. After eating donuts (Brayden was MUCH more enthusiastic this time about donuts, and ate half of a glazed donut and a whole chocolate glazed with sprinkles... I think we've found his new fave breakfast! ), we headed to a local festival before the heat of day set in. Unfortunately nothing was really up and running yet, so we took a good stroll around the downtown area and then headed home. Saturday afternoon the new fridge was delivered, and wouldn't you know it was in the middle of naptime, and as my luck would have it they had to take the door off of the hinges. This meant that B was woken from his nap, and he was CRANKY PANTS magoo all afternoon. I somehow managed to clean the house up considerably before Drew got home later that evening (between technicians and fridgerator deliveries, my floors were DISGUSTING, so I HAD to mop and vacuum). I still didn't have anything to cook, so we went to our local mexican restaurant and ate dinner as a family. Despite being tired, Drew and I both revved up enough energy to make a huge dent in our front room. For the past 6 years the front room (office/guest room/junk room) has collected an enormous amount of CRAP. I am not attached to ANYTHING, so I have gone through and thrown away a TON of stuff. We plan on putting some of the stuff in a garage sale later this fall, but the room HAS to be finished soon so that Brayden can move into the room and adjust a bit before Connor is born (in the midst of everything else we have going on this fall!). We actually were so productive that we cleared out our executive style desk and moved it all to the living room to our computer armoire (we purchased that several months ago off of craigslist before we had even found out about Connor, but never moved anything to it). Now the front room just needs to be moved to the trash or garage, and then I need to finish sorting stuff in the closet and rearranging the rest of the house to fit everything. As much as I HATE going through stuff, it feels good to get rid of JUNK. I kind of wished we did it annually just to stay on top of things so we didn't get attached to stuff/memorabilia/etc that we don't really need. In a house that's only 1300 square feet, it's almost necessary, especially with two kids! Believe it or not, today (Sunday) was the craziest day out of all of them for me. This morning I volunteered doing setup for a local consignment sale we have twice a year. It's where I get all of Brayden's clothes, so if I volunteer I am able to get in early before the public. It was actually a lot of fun meeting other moms and getting a little break from Brayden. After 4 hours of that, I went home, ate lunch and changed, and then headed to a baby shower for my friend Andrea, who is having baby Rylee in about 6 weeks. 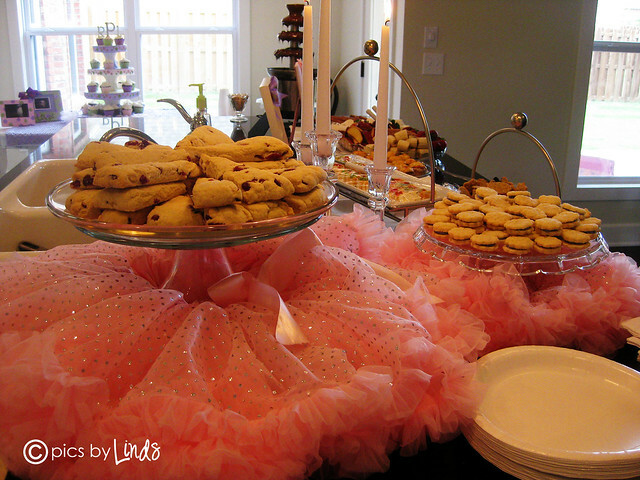 Part of the spread-- the food was SO yummy! 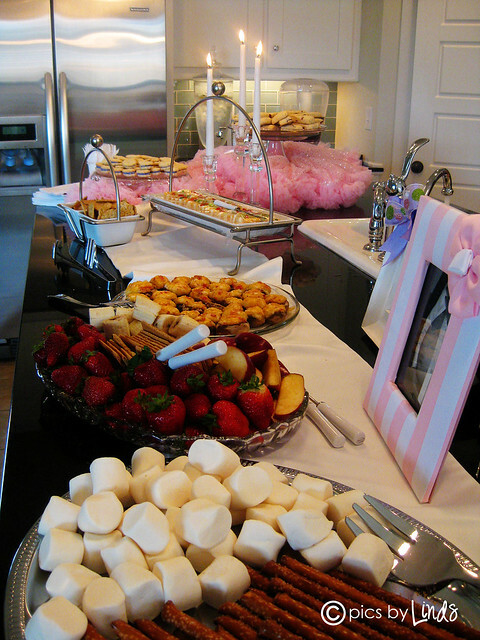 The other half of the spread... they also had a chocolate fountain... pretty sure I ate most of those strawberries! 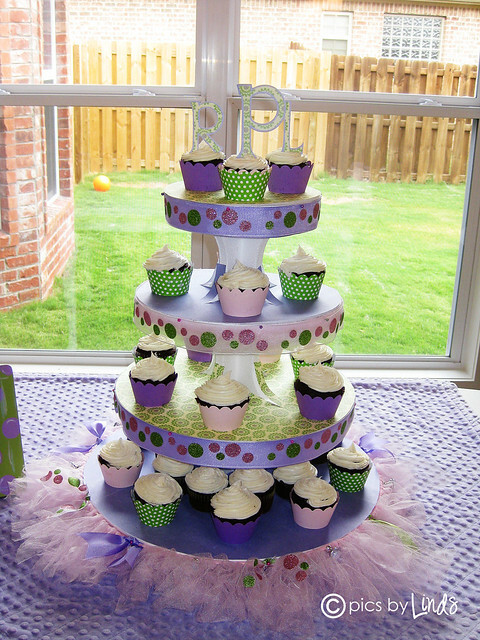 The cute cupcake tower-- all of the colors matched Rylee's room! Andrea with one of her many cute gifts. Can you believe that she's 34 weeks pregnant? I swear I am way bigger than her and I am 8 weeks behind! RIDICULOUS I tell you! 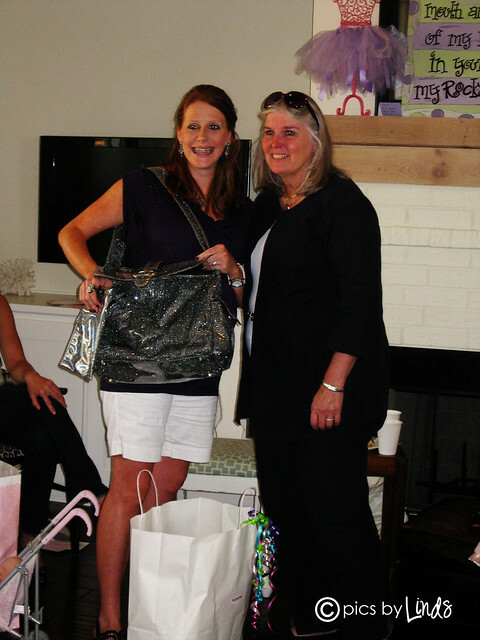 Andrea's MIL got her this super blinging Kalencom diaper bag. If you are looking for a good diaper bag, I HIGHLY recommend Kalencom. 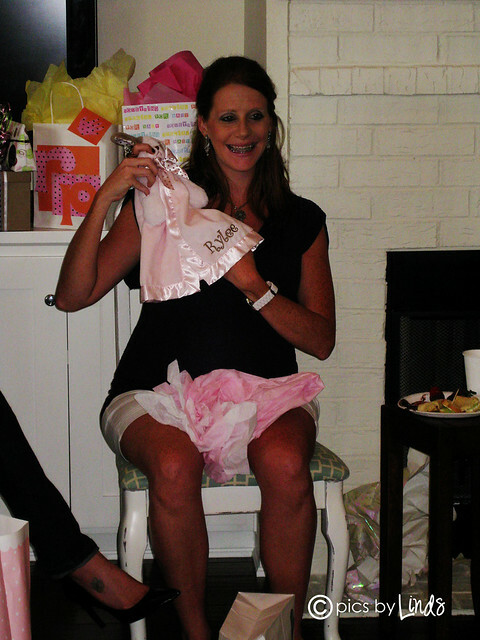 I have one and it is AMAZING (if you can even describe a diaper bag as amazing... LOL!). Isn't this canvas ADORABLE?! There's a local gal here that makes the CUTEST canvases. I LOVE her writing-- if only I could write like that! 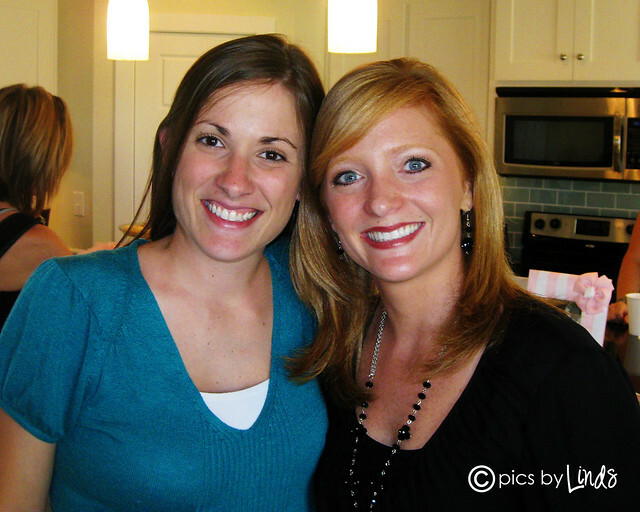 One of my BFF's Alaina. 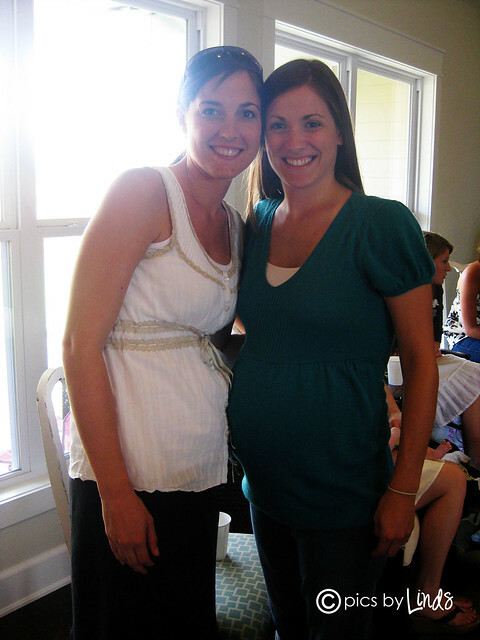 She's due 6 weeks (technically 8, but she is induced early for her pregnancies) after me with baby #3 (a BOY!). Finally my boys will have another boy to play with!!! I swear all of my friends are girl FACTORIES! Another BFF Candice. Candice and I have good laughs together since her little girl Laci is just as active and strong willed as Brayden. Laci and Brayden definitely feed off of each other's energy when they are together! After the shower, I headed home, cleaned up the house just a bit, fed B dinner, and then we headed to community group. I didn't get home until about 8:45pm, so basically I was gone for 12 hours straight! CRAZY! I plan on taking it easy tomorrow and trying to get my house back in working order before our big labor day weekend. Hope everyone has a good week!